Cal Junk is a full-service Junk Removal & Junk Hauling company, servicing both residential and commercial clients. With our quick response and hassle free pick-up, getting rid of your accumulated clutter has never been easier! The process…it’s simple like 1-2-3! You show us exactly what you need removed. Our knowlegable staff will provide you with an exact quote and thoroughly explain our pricing before any work begins. We lift, haul and load your items onto the truck and sweep the site thoroughly, if needed. Payment is processed, a receipt is given and your items are then transported to the appropriate facility for proper disposal. 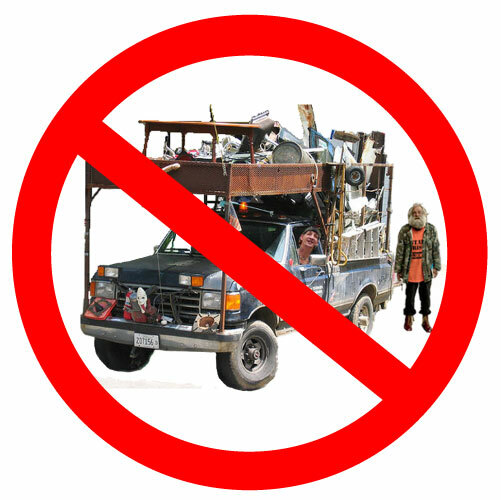 Eco Friendly junk removal….that’s our business! Appliance, electronics, computers, soil, and even used tires are just a few items we collect and recycle in the most eco-friendly manner. Used furniture, books, clothing, toys and other household items are donated to local charities across the city. Materials such as bricks, lumber, old doors and counter tops are delivered to organizations, like Habitat for Humanity, to be put to good use! No matter how big or small the items are, Cal Junk can help you unclutter your home, create new space and bring order in to your life. So, if you’ve got junk accumulating in your basement, attic, backyard or office and not sure how to get rid of it, call us today or book your junk pick-up appointment online and experience for yourself why we are Sacramento’s fastest growing environmentally-friendly junk removal company. Whether you have the daunting task of emptying a deceased relative’s home or apartment or your relative is simply moving out of their home to an assisted living facility, we can take on the task of sorting and removing the junk they left behind and get it done quickly. We know how to work through the ordeal quickly by working with you and helping with identification and sorting of the junk to be removed from sellable items, and disposing of / recycling the junk items expeditiously. We have expert appraisers that can identify valuable items for possible sale or donation. Cal Junk Removal provides commercial clients with professional and insured junk removal experts to haul away unwanted furniture, cubicles, drywall, carpets, construction debris, and other commercial items, regardless of where they are located in your building. We help property management companies with tenant improvements and debris removal. Banks, lenders, and landlords can utilize our comprehensive services for their foreclosure and eviction processes. If you are a property manager, superintendent, contractor, or any other commercial related industry that can benefit from expedited junk removal services, Sac Junk Removal has the professional solution to your bulk trash removal needs. Our trained professionals remove junk that is left-behind or unwanted items from foreclosures, evictions, abandoned storage spaces, or previous tenants. We will clean out entire homes, apartments, condos, and retail spaces, including all removal of junk furniture, flooring, fixtures, papers, trash, and other debris. We’ll leave you with a neat, broom clean new space. Sometimes tenants leave behind junk items such as trash, exercise equipment, furniture, kitchen appliances, office equipment, yard waste, and old clothes. Banks lenders need to have this junk removed so they can effectively begin marketing or remodeling their properties. Sac Junk will clean out each room, yard, and garage/attic space. We will donate and recycle items if possible, and take everything else to the proper disposal facility. Our objective is to donate and/or recycle items whenever possible. The remaining items will be properly disposed of. Whether you’re getting rid of an old conference table, some cubicle partitions, or old equipment fixtures, our junk removal services are the fastest way to clean out your space and make room for new projects. Just one phone call gets the job done. Cal Junk Removal specializes in helping offices and businesses get rid of old unwanted or broken furniture, fixtures, carpet, partitions, cubicles, and other bulky junk. We remove and junk commercial equipment, business machines, junk shelving, copy machines, display cases, receptionist desks, glass showcases, office chairs, and junk appliances, chairs, and tables from lunchrooms.